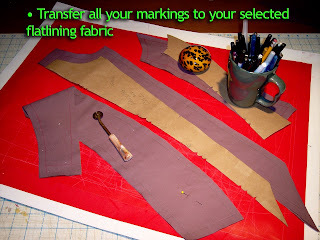 I touched a little upon my sewing process in a previous post called "How I Sew, Part 1". Well, now I'm going to get a bit more detailed, because it dawned on me that this new vest project could be perfect to use as a tutorial. Those of you who may not be incredibly interested in sewing may find this post a complete and utter bore. But for those who are curious, this might be useful to you (hopefully). Consider it a walk-through "Project Runway" experience! I've been snapping pictures along the way as I work through each step. This particular post has a lot of pictures, because as I discuss details, I need visuals. So it may seem a bit longer than most posts. Below is a picture of what my finished pattern looked like when I was done. 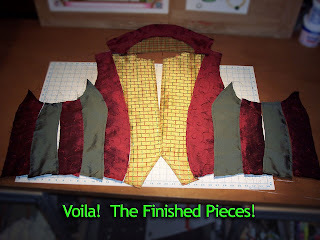 I added a collar, extended the shoulder seam, and cut many of the pieces into halves... I also created a facing piece for the lining along the center front button closure on the inside. This process required me to make notches in the new pieces I made, just to make sure that I was lining all the curves up correctly. I knew what I was wanting--a festive vest with vertical panels in Christmas colors. The pic below is a shot of the fabrics that I chose. Not that the gold fabric is sheer... I would need to mount this to another fabric in order to use it, otherwise my vest lining would show through (or, alternatively, this vest could be worn only at adult oriented Christmas Parties... hehe...). All of the fabrics were actually too flimsy to use on their own. I think they may have actually been drapery fabrics, and so they hang beautifully but have no body whatsoever. All of them would need to be supported somehow. The solution to flimsy fabrics? Flatlining. I would essentially "marry" two different pieces of fabric into one. And that meant finding a fabric to meld onto my fancy outside fabrics that wouldn't be seen but would bolster it up and make it a bit sturdier. I chose a cheap $1/yard cotton broadcloth. Akin to muslin, it would do the trick. The process is called flatlining, not lining. Lining is a separate piece of fabric that makes wearing easier and more comfortable. This is a structural method. I took my pattern pieces, laid them out on the cotton (making sure the grain lines match), and traced around each paper guide with a sharp soft lead pencil. Making sure to make little pencil marks where I had cut out all the notches, I then traced around the edges of each pattern 1/2" away. This was my cut line. I now would have a 1/2" seam allowance. Finally, I cut each piece out. I then used transfer paper and a pouncer to transfer the lines on one piece of fabric to the second piece of fabric underneath it. Voila! You have a left side and a right side! My transfer paper is red, and it's mounted to a piece of poster board for easy use. My pouncer is flat, so it creates solid lines. I use paper weights and cups to hold down my patterns, or I simply pin the paper to the fabric. The next step is the hard one, and you need good eyes. But it's a REAL time saver. 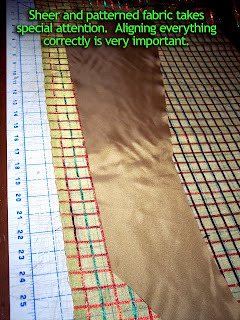 Instead of tracing each layer out separately, I simply take my newly marked flatlining and place it on the fancy fabric. The trick is to make sure the grain lines match up... What's a grain line you ask? It's the direction of the threads. If the flatlining and the fancy fabric don't line up with the same direction, the two pieces won't behave nicely, and they'll sorta fight. (My analogy about marrying to the two pieces together isn't so far off, but there isn't an option for counseling in the fabric world...). The edge of the fabric is indicative of the direction of the grain. 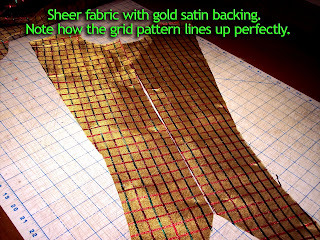 The picture below is comparing the grain line of a flatlining piece with the grain of the fabric underneath it by using the edge to see if it's laid down straight. 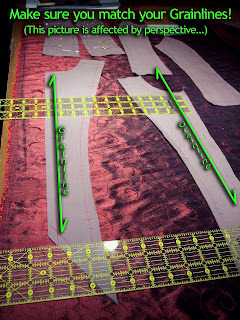 The direction of the threads in the flatlining should match the directions of the fabric, and I measured out from the edge at the top of my flatlining piece and at the bottom, making sure they were the same distance from the edge. Otherwise, if they were off (even by a little bit) the pieces wouldn't fit, and the next step would be a nightmare. 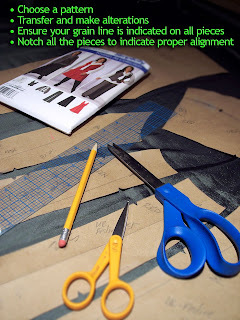 It's important to make sure that your flatlining pieces were cut out following each pattern piece's indicated guideline. 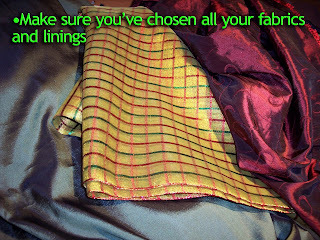 If they weren't you're setting yourself up for trouble even before you get to laying them out on your fancy fabric. Pinning is also important. 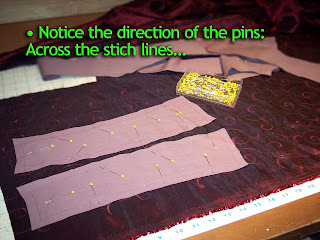 I pin the two pieces together along the stitch line, crossing it. Some people pin their flatlining along the stitch lines. I find that problematic at this stage, cuz I just wanna get these two pieces together without having to care about taking the pins out as I sew... So I pin them together so I don't have to take the pins out at all... Lazy? Maybe. Time saving? Definitely! You'll notice in the picture below that I use quilting pins. I like them. They have the plastic head that make them easy to pic up with my stubby "man-fingers", and they're long, thinner, and usually sharp. I find they work with a wider variety of fabrics than the traditional shorter pins used for sewing, because they're simply easier to handle. I also have a specific pair of sheers for cutting delicate fabrics. While it would be nice to use one pair of sheers for all purposes, sometimes those big honkin' 12" cutters are too big to wield easily for floaty wafting fabrics that demand a softer touch. Now I had to deal with that sheer metallic fabric I chose. Backing it with a second fabric, I cut out that piece, placed it on my sheer, and cut those out first before I pinned my flat lining to it. Seemed easier to me that way. Notice the grid created by the red and green stripes. How weird would it look if they weren't symmetrical on the body? Or if one panel ran in one direction and the other panel on the other side of the body ran in a different direction? Probably not so fashionably kosher. "Like, how homemade lookin', dude!" So a little attention to lining up the grain line and making sure both pieces are exactly the same will save a lot of embarrassment later on. Finally, the two pieces are cut out! Now to have the marriage ceremony and sew all the layers together! 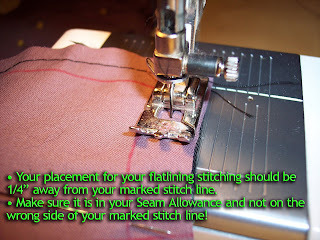 Flat lining is stitched 1/4" away from your stitch line, which is conveniently half a presser foot width on your machine! Look at the pic below to see the correct placement of the stitch line. This is a Vegas wedding, so your stitch length should be as long as you can get it so the whole thing is done as quickly as possible. Wham! Bam! We wanna get to the next step of actually assembling the garment! However, being in too much of a hurry isn't good either. Check out what happened to me below: a shoddy needle I ignored too long. See what happens when you don't put into your machine a fresh, clean, bur-free needle of an appropriate size for your delicate fabrics? Your threads revolt, and you get stripes. Icky, ugly pulled stripes from threads that got beat up by your crude, brutish needle. Usually, a sleek clean needle pushes the threads aside, but not this one. 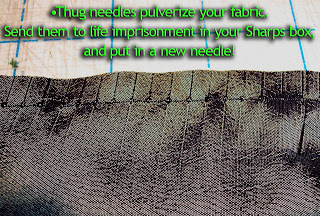 This particular needle was a real thug, and simply shoved his way through, and met with resistance! Viva la Resistance! Yeah, well, your seem ends up looking crappy. Best to avoid confrontation altogether, and keep your neighborhood watch active: change your needles!!! Okay, so finally, having married all these pieces (busy little Vegas sewing machine, eh? ), I laid them out on the table to see how it would look eventually. And then I thought of the lining I was gonna add. And decided I'd do that tomorrow. So. This one was LONGGGG! But I think it's helpful to anyone who is curious about the sewing process I follow. And perhaps a little inspirational, too. I do all of this in my garage, on the top of an old door set on two shelving units. You don't need a fancy schmancy sewing room to do it (although in my dreams, my studio is to DIE for, and someday I'll have that...). Alrighty, next entry, we move on to assembling the garment! Saints alive man! I am out of breath, can't keep up with you. You are a busy one. All the garments look fab. Very resourceful and creative use of fabrics. Those coats are wonderful, very dramatic. I am enjoying 'how you sew', very informative and yes, inspirational. I would love to take some pattern making classes some time. 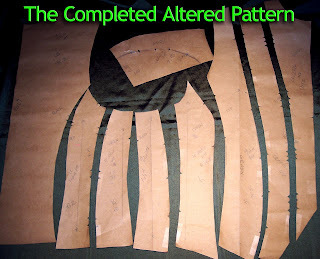 As it is, if I use a commercial pattern I must alter it in some way - cut it into pieces or change sleeves etc. I do make my own patterns (the last one I made I used dinner plates for a template ;)) but, I am sewing mostly for children...so much easier, so little fitting required. Can't wait for the next installment. Have a lovely day! Lola--Well, as fast as I can be, I can also grind to a complete stop... Maintaining a consistent speed has been a problem I've dealt with for years... Seems that when I get inspired--Look Out! But when the fire is gone you can poke me with a stick: I'm so done. I have to figure out a way to maintain the enthusiasm over the long haul, and that's something I have on my list to explore more about... Any ideas about that? I have a friend who sews for children, and while it may be less fitted, it can certainly be complicated in it's own ways... I have never made anything for kids. Hm. Maybe I should explore that? That could be fun!!! A Dinner plate??? I can't WAIT to find out what was made from that! LOL! Cool!! I can suggest a couple books that you might find interesting, and they both have good chapters on how to draft up your own patterns: Costume Construction by Katherine Strand-Evans, and The costume Technicians Handbook by Rosemary Ingham and Liz Covey. They helped me a LOT. Good luch, Nova--it's always fun to hear from ya!